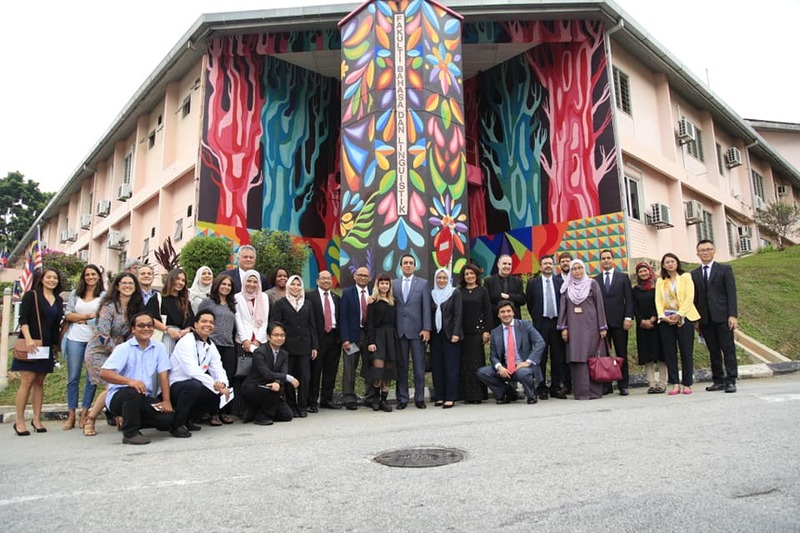 The Faculty of Languages and Linguistics (FLL), University of Malaya (UM) in collaboration with the Colombian Embassy in Malaysia have launched a mural on 27 August 2018. This mural was painted by a famous Colombian artist, Diana Ordóñez, who is also known as LeDania. The production of this flagship mural was funded by the Embassy of Colombia in Malaysia and the Colombian Ministry of Foreign Affairs. 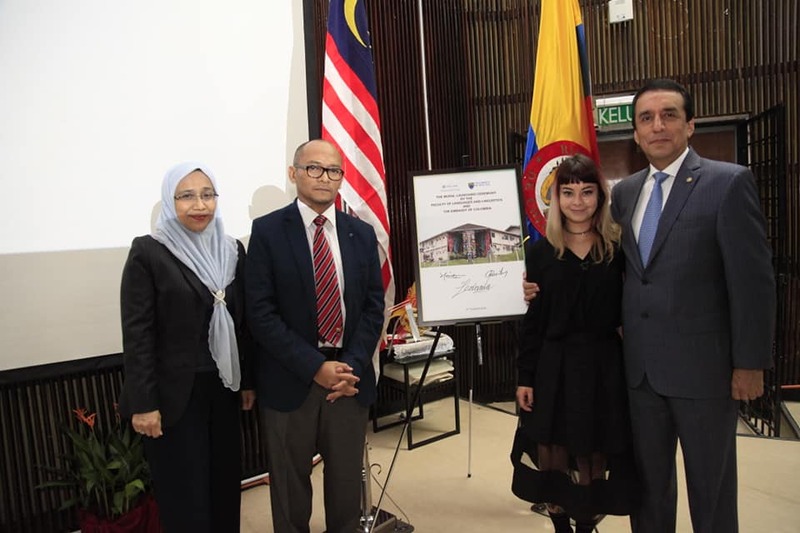 It was donated to the Faculty of Languages and Linguistics, University of Malaya as part of their ‘Promotion Plan of Colombia Abroad’ program. The event was attended by the Colombian ambassador to Malaysia, H.E. Mauricio González Lopez, representing the Colombian Ministry of Foreign Affairs, the Minister Counsellor of the Colombian Embassy in Malaysia, Mr Raúl Sánchez Niño, the Deputy Vice-Chancellor of Development of UM, Professor Dr. Faisal Rafiq Mahamd Adikan, the Dean of FLL, Associate Professor Dr. Hajah Jariah Mohd Jan, invited guests, management and members of the faculty. The Ambassadors of Cuba and Venezuela were also attended the ceremony to show their support for the Spanish arts and culture. Embassies of Spain, Peru, Uruguay, Argentina and Brazil have been represented by their Minister Counsellors, Head of Missions and their respective cultural attachés. The muralist, LeDania based in the city of Bogotá, has produced murals across the globe. Her nature-inspired mural at FLL began on August 18, 2018 and it was completed on August 24, 2018. The mural entitled “Habitat de lenguajes” symbolizes diversity of languages and all forms of knowledge in the world. The roots represent the importance of personal development. 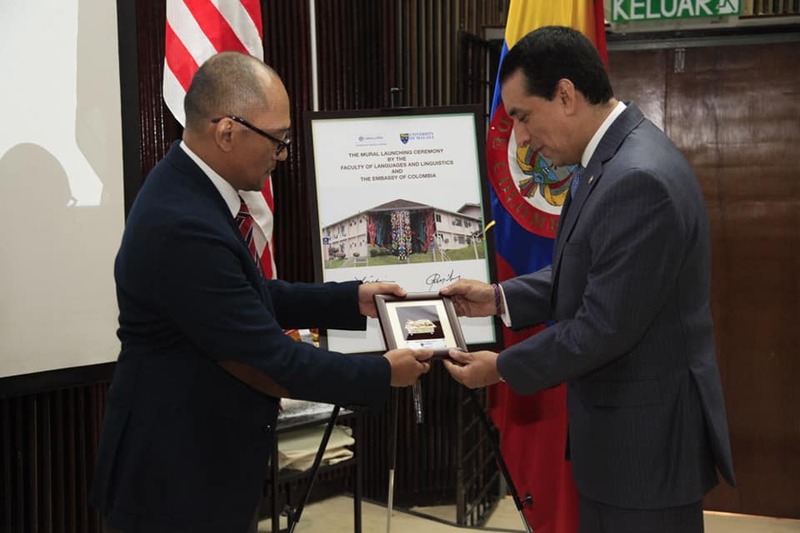 This collaboration aims to foster and strengthen ties between the University of Malaya and the Colombian government. Recently, the Colombian government also sponsored two Spanish language students from FLL, UM to pursue a program at EAFIT University and Medellin University in Colombia under the ELE FOCALAE program.